Lately I have been quite exhausted and tired as it is hard work when you see so many patients in a day. I definitely lost track of the difference I was making and started to just see my patients as just another foot to cast or another leg to give exercises to. I caught myself saying things like “oh my gosh I have 15 or 20 feet to cast today” (which definitely isn’t a good attitude to have because there are people whom God loves attached to those feet). So I guess I was becoming a little desensitised to the difference I was making…. Anyways so I prayed to God simply to remind me what difference I am making, and then came along a little boy called Junior… who reminded me of why I am in West Africa. So he is about 6 years old and use to have bow legs (before he came to us). Anyways his mum was telling us what we had done for him. She was saying that his whole life he had been teased by all the other little kids because of his deformity. The other little kids use to chase after him and tease him cause of the way that he looked with his bow legs, the sad thing was that he could never run away from them as he was too slow. Anyway Junior wasn’t like any boy, he would never back down and always stand up for himself and say “you’ll see one day my legs will be straight and I will chase after you”. His mum was telling us that she had taken him to another hospital and Junior said “maybe this is how my legs will become straight”. But this hospital had said that there is nothing they could do, anyways Junior continued to believe that one day his legs would be straight so he just said to them politely “that’s ok, one day my legs will be straight”. As the years went on he continued to believe that one day his legs would be straight. Now this 6 year old boy had heard that Mercy Ships were coming to Lome and he said to his mum this is finally how my legs will become straight. And low and behold he was picked up at our screening day, had the surgery and now his legs are finally straight. He is running very fast and playing soccer and now is ready to go back to his village. Actually by now he will be in his village, legs straight and chasing after all the other little kids saying I told you so “one day my legs would be straight”. For me it’s when I hear stories like these that it makes being here in West Africa worthwhile. Actually I would really like to share something else which has simply blown me away. The more time I have spent here and the more lives we impact like Junior the more I find my heart being drawn back here. I had perhaps saw myself coming back in 5 or so years as I thought there was no possible way for me to come back anytime sooner other than quitting my job in Brisbane and I really wouldn’t want to do that as I really love my life in Brisbane and definitely see myself there long term. But at the same time I was thinking how awesome it would be to come back next year. Anyways what I have learned by way of experience is to sometimes leave things in God’s hands and just say – “perhaps maybe” perhaps maybe God could open up some doors for me to come back sooner, even in the midst of every door being apparently closed. 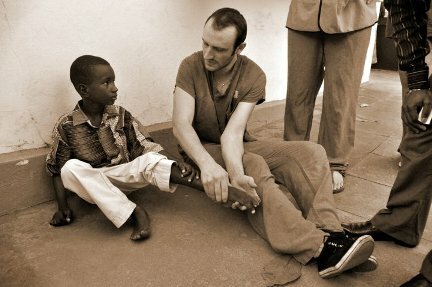 Anyways one of our little kids who we are treating for club foot (who has an amazing story of their own – but maybe for another time anyways his mum was very thankful for what we are doing for him and she said something to me which I thought was kind of weird since she had no idea of my situation. She said that she was praying for the impossible to become possible for me. And when I heard this I new exactly what she was talking about, even though she didn’t. So I decided to email my boss back in Brisbane just to see if I coming back next year was a possibility (and I even said to her that I was completely expecting her to say no and that I was fine with this). Anyways as God would have it I found out just the other day that my work back in Brisbane has given me another 9 months off to come back to Sierra Leone next year. I am so thankful for all the caring people at Royal Brisbane hospital who have released me to serve in Africa. And I am always thankful for a God that answers prayers.